Perhaps the most influential of the muckrakers was Lincoln Steffens. Steffens’ articles were published in McClure’s magazine in 1902 and 1903 and then collected in The Shame of the Cities, published in 1904. 1. What is Steffens’ opinion regarding businessmen? 2. What is Steffens’ opinion regarding politics in America? 3. What influence did Steffens think business had on politics? 4. Were Steffens’ criticisms accurate in 1904? Are they accurate now? Now, the typical American citizen is the business man. The typical business man is a bad citizen; he is busy. If he is a “big business man” and very busy, he does not neglect, he is busy with politics, oh, very busy and very businesslike. I found him buying boodlers in St. Louis, defending grafters in Minneapolis, originating corruption in Pittsburgh, sharing with bosses in Philadelphia, deploring reform in Chicago, and beating good government with corruption funds in New York. He is a self-righteous fraud, this big business man. He is the chief source of corruption, and it were a boon if he would neglect politics. But he is not the business man that neglects politics; that worthy is the good citizen, the typical business man. He too is busy, he is the one that has no use and therefore no time for politics. When his neglect has permitted bad government to go so far that he can be stirred to action, he is unhappy, and he looks around for a cure that shall be quick, so that he may hurry back to the shop. Naturally, too, when he talks politics, he talks shop. His patent remedy is quack; it is business. “Give us a business man,” he says (“like me,” he means). “Let him introduce business methods into politics and government; then I shall be left alone to attend to my business.” There is hardly an office from United States Senator down to Alderman in any part of the country to which the business man has not been elected; yet politics remains corrupt, government pretty bad, and the selfish citizen has to hold himself in readiness like the old volunteer firemen to rush forth at any hour, in any weather, to prevent the fire; and he goes out sometimes and he puts out the fire (after the damage is done) and he goes back to the shop sighing for the business man in politics. The business man has failed in politics as he has in citizenship. Why? Because politics is business. And as for giving bad government or good, how about the merchant who gives bad goods or good goods, according to the demand? But there is hope, not alone despair, in the commer-cialism of our politics. If our political leaders are to be always a lot of political merchants, they will supply any demand we may create. All we have to do is to establish a steady demand for good government. The boss has us split up into parties. To him parties are nothing but means to his corrupt ends. He ‘bolts” his parry, but we must not; the bribe-giver changes his party, from one election to another, from one county to another, from one city to another, but the honest voter must not. Why? Because if the honest voter cared no more for his party than the politician and the grafter, their the honest vote would govern, and that would be bad—for graft. It is idiotic, this devotion to a machine that is used to take our sovereignty from us. See pp. 386-390 in your text for more information. But, to speak practically and as a citizen, unlike those who call themselves no-government men, I ask for, not at one no government, but at once a better government. Let every man make known what kind of government would command his respect, and that will be one step toward obtaining it. After all, the practical reason why, when the power is once in the hands of the people, a majority are permitted, and for a long period continue, to rule is not because they are most likely to be in the right, nor because this seems fairest to the minority, but because they are physically the strongest. But a government in which the majority rule in all cases can not be based on justice, even as far as men understand it. Unjust laws exist: shall we be content to obey them, or shall we endeavor to amend them, and obey them until we have succeeded, or shall we transgress them at once? Men, generally, under such a government as this, think that they ought to wait until they have persuaded the majority to alter them. They think that, if they should resist, the remedy would be worse than the evil. But it is the fault of the government itself that the remedy is worse than the evil. It makes it worse. Why is it not more apt to anticipate and provide for reform? Why does it not cherish its wise minority? Why does it cry and resist before it is hurt? Why does it not encourage its citizens to put out its faults, and do better than it would have them? Why does it always crucify Christ and excommunicate Copernicus and Luther, and pronounce Washington and Franklin rebels? A minority is powerless while it conforms to the majority; it is not even a minority then; but it is irresistible when it clogs by its whole weight. If the alternative is to keep all just men in prison, or give up war and slavery, the State will not hesitate which to choose. If a thousand men were not to pay their tax bills this year, that would not be a violent and bloody measure, as it would be to pay them, and enable the State to commit violence and shed innocent blood. This is, in fact, the definition of a peaceable revolution, if any such is possible. I have paid no poll tax for six years. I was put into a jail once on this account, for one night; and, as I stood considering the walls of solid stone, two or three feet thick, the door of wood and iron, a foot thick, and the iron grating which strained the light, I could not help being struck with the foolishness of that institution which treated my as if I were mere flesh and blood and bones, to be locked up. I wondered that it should have concluded at length that this was the best use it could put me to, and had never thought to avail itself of my services in some way. I saw that, if there was a wall of stone between me and my townsmen, there was a still more difficult one to climb or break through before they could get to be as free as I was. I did nor for a moment feel confined, and the walls seemed a great waste of stone and mortar. From an excellent exhibit at the American Memory Project at the Library of Congress. “It was a needed instrument to spread abroad the truth of a new gospel to woman, and I could not withhold my hand to stay the work I had begun. I saw not the end from the beginning and dreamed where to my propositions to society would lead me,” said Amelia Bloomer, describing her feelings as the first woman to own, operate and edit a newspaper for women. Bloomer, a woman of modest means and little education, nevertheless felt driven to work against social injustice and inequity — and her personal convictions inspired countless other women to similar efforts. Bloomer’s newspaper, The Lily, began in 1849 in Seneca Falls, New York, where Bloomer lived after her marriage. The newspaper was initially focused on temperance, but under the guidance of Elizabeth Cady Stanton, a contributor to the newspaper, the focus soon became the broad issues of women’s rights. An intriguing mix of contents ranging from recipes to moralist tracts, The Lily captivated readers from a broad spectrum of women and slowly educated them not only about the truth of women’s inequities but in the possibilities of major social reform. This first newspaper became a model for other suffrage periodicals that played a vital role in providing suffrage leaders and followers with a sense of community and continuity through the long years of the campaigns for the right to vote. Bloomer was also known for her support for the outfit of tunic and full “pantelettes,” initially worn by actress Fanny Kemble and others, including Stanton. 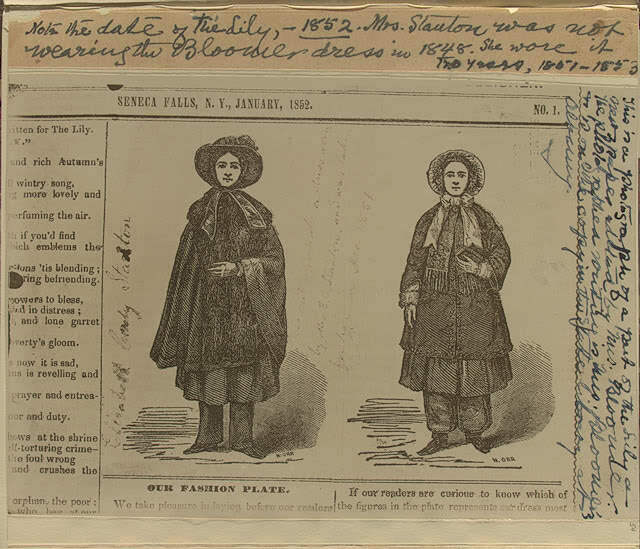 Bloomer defended the attire in The Lily, and her articles were picked up in The New York Tribune. Soon the outfit was known as “The Bloomer Costume,” even though Bloomer had no part in its creation. Ultimately Bloomer and other feminists abandoned the comfortable outfit, deciding that too much attention was centered on clothing instead of the issues at hand. Bloomer remained a suffrage pioneer and writer throughout her life, leading suffrage campaigns in Nebraska and Iowa, as well as writing for a wide array of periodicals. Excerpted from: “Liquid Fire Within Me”: Language, Self and Society in Transcendentalism and early Evangelicalism, 1820-1860, M.A. Thesis in English by Ian Frederick Finseth, 1995. THE EMERGENCE of the Transcendentalists as an identifiable movement took place during the late 1820s and 1830s, but the roots of their religious philosophy extended much farther back into American religious history. Transcendentalism and evangelical Protestantism followed separate evolutionary branches from American Puritanism, taking as their common ancestor the Calvinism of the seventeenth and eighteenth centuries. Transcendentalism cannot be properly understood outside the context of Unitarianism, the dominant religion in Boston during the early nineteenth century. Unitarianism had developed during the late eighteenth century as a branch of the liberal wing of Christianity, which had separated from Orthodox Christianity during the First Great Awakening of the 1740s. That Awakening, along with its successor, revolved around the questions of divine election and original sin, and saw a brief period of revivalism. The Liberals tended to reject both the persistent Orthodox belief in inherent depravity and the emotionalism of the revivalists; on one side stood dogma, on the other stood pernicious “enthusiasm.” The Liberals, in a kind of amalgamation of Enlightenment principles with American Christianity, began to stress the value of intellectual reason as the path to divine wisdom. The Unitarians descended as the Boston contingent of this tradition, while making their own unique theological contribution in rejecting the doctrine of divine trinity. Our leading principle in interpreting Scripture is this, that the Bible is a book written for men, in the language of men, and that its meaning is to be sought in the same manner as that of other books…. With these views of the Bible, we feel it our bounden duty to exercise our reason upon it perpetually, to compare, to infer, to look beyond the letter to the spirit, to seek in the nature of the subject, and the aim of the writer, his true meaning; and, in general, to make use of what is known, for explaining what is difficult, and for discovering new truths. The intellectual marrow of Unitarianism had its counterbalance in a strain of sentimentalism: while the rational mind could light the way, the emotions provided the drive to translate ethical knowledge into ethical conduct. Still, the Unitarians deplored the kind of excessive emotionalism that took place at revivals, regarding it as a temporary burst of religious feeling that would soon dissipate. Since they conceived of revelation as an external favor granted by God to assure the mind of its spiritual progress, they doubted that inner “revelation” without prior conscious effort really represented a spiritual transformation. Nonetheless, even in New England Evangelical Protestants were making many converts through their revivalist activities, especially in the 1820s and 1830s. The accelerating diversification of Boston increased the number of denominations that could compete for the loyalties of the population, even as urbanization and industrialization pushed many Bostonians in a secular direction. In an effort to become more relevant, and to instill their values of sobriety and order in a modernizing city, the Unitarians themselves adopted certain evangelical techniques. Through founding and participating in missionary and benevolent societies, they sought both to spread the Unitarian message and to bind people together in an increasingly fragmented social climate. Ezra Stiles Gannett, for example, a minister at the Federal Street Church, supplemented his regular pastoral duties with membership in the Colonization, Peace and Temperance societies, while Henry Ware Jr. helped found the Boston Philanthropic Society. Simultaneously, Unitarians tried to appeal more to the heart in their sermons, a trend reflected in the new Harvard professorship of Pastoral Theology and Pulpit Eloquence. Such Unitarian preachers as Joseph Stevens Buckminster and Edward Everett “set the model for a minister who could be literate rather than pedantic, who could quote poetry rather than eschatology, who could be a stylist and scorn controversy.” But they came nowhere near the emotionalism of the rural Evangelical Protestants. Unitarianism was a religion for upright, respectable, wealthy Boston citizens, not for the rough jostle of the streets or the backwoods. The liberalism Unitarians displayed in their embrace of Enlightenment philosophy was stabilized by a solid conservatism they retained in matters of social conduct and status. The Transcendentalists felt that something was lacking in Unitarianism. Sobriety, mildness and calm rationalism failed to satisfy that side of the Transcendentalists which yearned for a more intense spiritual experience. The source of the discontent that prompted Emerson to renounce the “corpse-cold Unitarianism of Brattle Street and Harvard College” is suggested by the bland job description that Harvard issued for the new Professor of Natural Religion, Moral Philosophy and Civil Polity. The professor’s duties were to demonstrate the existence of a Deity or first cause, to prove and illustrate his essential attributes, both natural and moral; to evince and explain his providence and government, together with the doctrine of a future state of rewards and punishments; also to deduce and enforce the obligations which man is under to his Maker …. together with the most important duties of social life, resulting from the several relations which men mutually bear to each other; …. interspersing the whole with remarks, showing the coincidence between the doctrines of revelation and the dictates of reason in these important points; and lastly, notwithstanding this coincidence, to state the absolute necessity and vast utility of a divine revelation. The ecstasy and the vision which Calvinists knew only in the moment of vocation, the passing of which left them agonizingly aware of depravity and sin, could become the permanent joy of those who had put aside the conception of depravity, and the moments between could be filled no longer with self-accusation but with praise and wonder. For the Transcendentalists, then, the critical realization, or conviction, was that finding God depended on neither orthodox creedalism nor the Unitarians’ sensible exercise of virtue, but on one’s inner striving toward spiritual communion with the divine spirit. From this wellspring of belief would flow all the rest of their religious philosophy. The method [of Kantian philosophy] is synthetical, proceeding from a given point, the lowest that can be found in our consciousness, and deducing from that point ‘the whole world of intelligences, with the whole system of their representations’ …. The last step in the process, the keystone of the fabric, is the deduction of time, space, and variety, or, in other words (as time, space, and variety include the elements of all empiric knowledge), the establishing of a coincidence between the facts of ordinary experience and those which we have discovered within ourselves …. Although written in a highly intellectual style, as many of the Transcendentalist tracts were, Hedge’s argument was typical of the movement’s philosophical emphasis on non-rational, intuitive feeling. The role of the Continental Romantics in this regard was to provide the sort of intellectual validation we may suppose a fledgling movement of comparative youngsters would want in their rebellion against the Harvard establishment. …truth lights her torch in the inner temple of every man’s soul, whether patrician or plebeian, a shepherd or a philosopher, a Croesus or a beggar. It is only on the reality of this inner light, and on the fact, that it is universal, in all men, and in every man, that you can found a democracy, which shall have a firm basis, and which shall be able to survive the storms of human passions. To Norton, such a rejection of the existence of divine miracles, and the assertion of an intuitive communion with God, amounted to a rejection of Christianity itself. In his reply to the Transcendentalists, “A Discourse on the Latest Form of Infidelity,” Norton wrote that their position “strikes at root of faith in Christianity,” and he reiterated the “orthodox” Unitarian belief that inner revelation was inherently unreliable and a potential lure away from the truths of religion. The religion of which they speak, therefore, exists merely, if it exists at all, in undefined and unintelligible feelings, having reference perhaps to certain imaginations, the result of impressions communicated in childhood, or produced by the visible signs of religious belief existing around us, or awakened by the beautiful and magnificent spectacles which nature presents. The miracles controversy revealed how far removed the Harvard rebels had grown from their theological upbringing. It opened a window onto the fundamental dispute between the Transcendentalists and the Unitarians, which centered around the relationship between God, nature and humanity. The heresy of the Transcendentalists (for which the early Puritans had hanged people) was to countenance mysticism and pantheism, or the beliefs in the potential of the human mind to commune with God and in a God who is present in all of nature, rather than unequivocally distinct from it. Nevertheless, the Transcendentalists continued to think of themselves as Christians and to articulate their philosophy within a Christian theological framework, although some eventually moved past Christianity (as Emerson did in evolving his idea of an “oversoul”) or abandoned organized religion altogether. It seemed a war between intellect and affection; a crack in Nature, which split every church in Christendom into Papal and Protestant; Calvinism into Old and New schools; Quakerism into Old and New; brought new divisions in politics; as the new conscience touching temperance and slavery. The key to the period appeared to be that the mind had become aware of itself. Men grew reflective and intellectual. There was a new consciousness …. The modern mind believed that the nation existed for the individual, for the guardianship and education of every man. This idea, roughly written in revolutions and national movements, in the mind of the philosopher had far more precision; the individual is the world. The Transcendentalists had stood at the vanguard of the “new consciousness” Emerson recalled so fondly, and it is for their intellectual and moral fervor that we remember them now as much as for their religious philosophy; the light of Transcendentalism today burns strongest on the page and in the classroom, rather than from the pulpit.